Since December last year the prediction market site Hypermind has been running a prediction market for US nominal GDP growth for 2015 (plus markets for each quarter of the year). 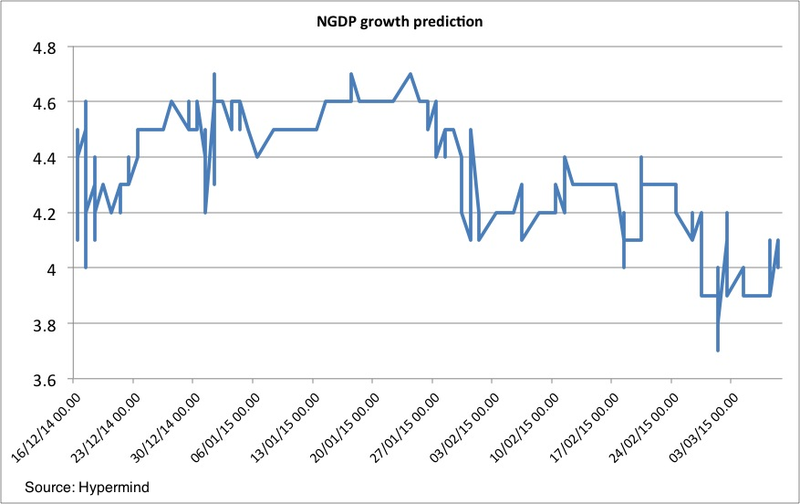 I think the development of a prediction market for NGDP growth is extremely interesting and such market can help us much better to understand monetary and economic issues. Furthermore, the Federal Reserve should be very excited about such markets as they provide a minute-by-minute “tracker” of the Fed’s performance and credibility. Of course the Federal Reserve does not official target nominal GDP growth, but I have earlier argued that the Fed effectively since Q2 2009 has kept US NGDP on a (very narrow) path close to a 4% trend. The graph below shows this. What does the Hypermind’s prediction market then tell us? Well, guess what – right now the market is predicting NGDP growth to be exactly 4% in 2015! So at least judging from the prediction market US monetary policy is right now perfectly calibrated to keep actual NGDP on the 4% path through 2015. This of course does not mean that US monetary policy is “perfect”. First, of all the Fed does not official have a 4% NGDP target. Second, communication about the Fed’s policy instrument(s) is far from perfect. But if we decide to say that the Fed effectively has a 4% NGDP target then at least the “market” now perceives this target as credible. My point is that the “average” forecast of the market often is a better forecast than the forecast of the individual forecaster. Furthermore, I know of no macroeconomic forecaster who has consistently over long periods been better than the “consensus” expectation. If my readers know of any such super forecaster I will be happy to know about them. …Unlike the market where the profit motive rules central banks and governments are not guided by an objective profit motive but rather than by political motives – that might or might not be noble and objective. It is well known among academic economists and market participants that the forecasts of government institutions are biased. For example Karl Brunner and Allan Meltzer have demonstrated that the IMF consistently are biased in a too optimistic direction in their forecasts. …Instead of relying on in-house forecasts central banks could consult the market about the outlook for the economy and markets. Scott Sumner has for example argued that monetary policy should be conducted by targeting NGDP futures. I think that is an excellent idea. However, first of all it could be hard to set-up a genuine NGDP futures markets. Second, the experience with inflation linked bonds shows that the prices on these bonds often are distorted by for example lack of liquidity in the particular markets. I believe that these problems can be solved and I think Scott’s suggestion ideally is the right one. However, there is a more simple solution, which in principle is the same thing, but which would be much less costly and complicated to operate. My suggestion is the central bank simply set-up a prediction market for key macroeconomic variables – including of the variables that the central bank targets (or could target) such as NGDP level and growth, inflation, the price level. …The experience with prediction markets is quite good and prediction markets have been used to forecast everything from the outcome of elections to how much a movie will bring in at the box office. A clear advantage with prediction markets is that they are quite easy to set-up and run. Furthermore, it has been shown that even relatively small size bets give good and reliable predictions. This mean that if a central bank set up a prediction market then the average citizen in the country could easily participate in the “monetary policy market”. I hence believe that prediction markets could be a very useful tool for central banks – both as a forecasting tool but also as a communication tool. A truly credible central bank would have no problem relying on market forecasts rather than on internal forecast. I of course understand that central banks for all kind of reasons would be very reluctant to base monetary policy on market predictions, but imagine that the Federal Reserve had had a prediction market for NGDP (or inflation for that matter) in 2007-8. Then there is no doubt that it would have had a real-time indication of how much monetary conditions had tightened and that likely would caused the Fed into action much earlier than was actually the case. A problem with traditional macroeconomic forecasts is that they take time to do and hence are not available to policy makers before sometime has gone by. With Hypermind’s NGDP prediction market we now have such a market I was calling for back in 2012 and in the future I will try to keep track of the Hypermind’s NGDP prediction market as I believe that such markets can teach us quite a bit about the workings of monetary policy. Furthermore, it would be extremely interesting to see a similar market being set up for the euro zone so I hope Hypermind in the future will find a sponsor to set up such a market. This is interesting – Gabe Newell on Youtube on the value of prediction markets. I love it…Gabe is co-founder and managing director of Video game developer video game development and online distribution company Valve Corporation (I stole that from Wikipedia). This guy is brilliant and he certainly understands markets.